VOLUNTEERS NEEDED: The City of Alexandria also has openings on some of our boards (see listing below). 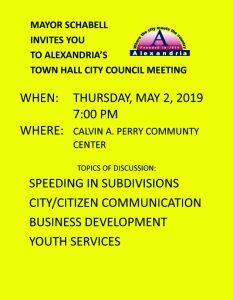 You MUST RESIDE inside Alexandria City Limits in order to be considered for these boards. If you are interested, please complete the attached COMMISSIONS AND BOARDS APPLICATION and return it to the City Clerk’s office at 8236 W. Main Street, Alexandria, KY 41001, or email to janj@alexandriaky.org. For any questions, please call 859-635-4125.